Those who know me might roll their eyes at this post, knowing me as someone who turns everything possible, political… but really, believe me, the cute pandas in the Taipei Zoo are in fact, political. Like any panda, in any zoo around the world, the two pandas in Taipei are gifts from Mainland China. This practice has even has a name: Panda Diplomacy—I recently learned that the idea isn’t new! It dates back to the Tang Dynasty when Empress Wu gifted pandas to Japan. The US received their first two pandas after Nixon’s historic visit. It’s China’s unique way to practice diplomacy with nations it has developed certain relations with. When 團團 (TuanTuan) and 圓圓 (YuanYuan) came to Taiwan in 2008, they were hugely controversial. One of Taiwan’s two main political parties, the Democratic Progressive Party (who strongly associate themselves with Taiwanese independence) fiercely protested the acceptance of these pandas. They see the pandas as propaganda by the Chinese government to pull Taiwan closer to reunification—after all, they’re names together 團圓 (Tuan Yuan) literally mean “family reunion”… However the party in power, the Kuomintang, welcomed the pandas. While the DPP requests that its party members do not visit the pandas, they still get long lines of visitor every day that required each guest to view the pandas only at their assigned time given to them upon entry to the park. You won’t get an opinion from me about whether or not the pandas should be here in Taipei, but I will testify that they are adorable! So I think I’ve had that experience that so many people told me I would have abroad… the one where you get lost, things DO NOT go as planned, and it turns out better (although very different) than you thought. Last weekend a group of classmates and I went to Hualien. Hualien is famous for its Taroko Gorge, which we all went to on Saturday, but on Sunday two of my friends and I decided to go to a place we’d heard about called the Sugar/Mochi Factory (Hualien is also famous for its mochi)… Still not sure if the factories are different places, if they both exist, or they’re the same place with two different names. The research we did online the night before gave us little info about how to get there so we went to the information center near the train station in Hualien to see if they knew anything about the place(s.) They seemed to know what we were talking about and told us to get on a particular bus and that it would take us there. We bought our tickets for what we thought would be at most a half hour ride…not sure why we made this assumption, it wasn’t going off of anything. It turned out to be the last stop the bus made, so an hour and a half later we were asking the bus driver if he knew how we should walk there from the bus stop. He, like the women at the information center, seemed to know what we were talking about, and offered to drop us off as close as he could get. When he stopped he pointed in a direction and we were on our way, in the rain, with out any real idea where to go… We were NOT in Taipei anymore. We were the only foreigners in sight, and much of what was around us was farmland. We guessed to turn right when we got to an intersection. We walked a bit more, and at this point we were truly lost. But the right turn happened to be a happy guess! What we stumbled upon next was a center of little shops full of aboriginal Taiwanese gifts, tea shops, and a Mochi store! Just for reference, this place is what I would consider the middle of absolutely nowhere, so I think we were fair in thinking we were on the right track to finding the factory. Busses of Taiwanese and Chinese tourists came every half hour, and all immediately went to the ice cream stand in the complex. First, we stopped to eat at “Taiwan Dumplings,” where of course, we ate dumplings, and for less than 2USD I might add, the further away we get from Taipei, the cheaper everything becomes. Then we decided to look around the shops as we asked people if they knew what we were trying to find. The shops were nothing like we would find in Taipei, even in the crafty night markets. They sold everything from aboriginal style jewelry (Hualien is home to one of many aboriginal groups in Taiwan, the Yami), to locally grown tea and coffee. While shopping and testing the many mochi flavors we continued to ask around about where the factory was. They all pointed in the same direction, so we crossed the street and entered the building they seemed to be pointing at. We entered “The Tea House” and were immediately welcomed by the family running the shop with a tea ceremony to test the locally grown tea. Before we could ask them where they thought we should go next, I was buying two tins of loose tea… it would be rude, I think, to go through the testing and not buy any, and it was great tea! We asked about the factory and they clearly pointed to where we had just come from. They said the “factory” is famous for its ice cream. We finally realized at that point, that we were not going to find the factory. No one was the least bit upset at how our day turned out. Being in this new place, so unlike where we have been living for the past three months made us realize that Taipei is far from all Taiwan has to offer. Of course, I love Taipei, but it far from represents everything in Taiwan. The small family owned shops with handmade crafts, the best mochi I’ve ever had, aboriginal culture and hospitality, all in this complex in the middle of farmland, all so far from Taipei reminds us how important it is get out and get lost. We decided we needed to try the ice cream (the green tea was delicious!) and laughed over how much fun poor planning can turn out. When originally thinking about this post, I wanted to begin by stating that since I’ve been in Taipei I’ve never seen anything close to an illegal act— but if I am going to be fully honest I must divulge what I saw last night: a man at the microwave station in 7-11 essentially inhaling a hot dog bun, with chicken nuggets inside. It seemed strange but what was even more shocking was the fact that he promptly made another one and walked out the door with out paying. Thus, I am not able to begin this post the way I would like. Except for the lapse (or lack) of judgment by this one man, I am happy to report that I have never seen someone even litter on the streets of Taipei, or the like. I have a feeling this stems from societal norms and expectations, but I cannot help but notice the number cameras interested in watching weather or not I take a sip of my bubble tea on the public transportation (like the metro I rode in DC all summer, eating and drinking on a train or bus is illegal.) A sign stating the presence of these cameras is easy to spot in most public places—I usually like to play a game finding them all (and of course, waving) when waiting for the next train. 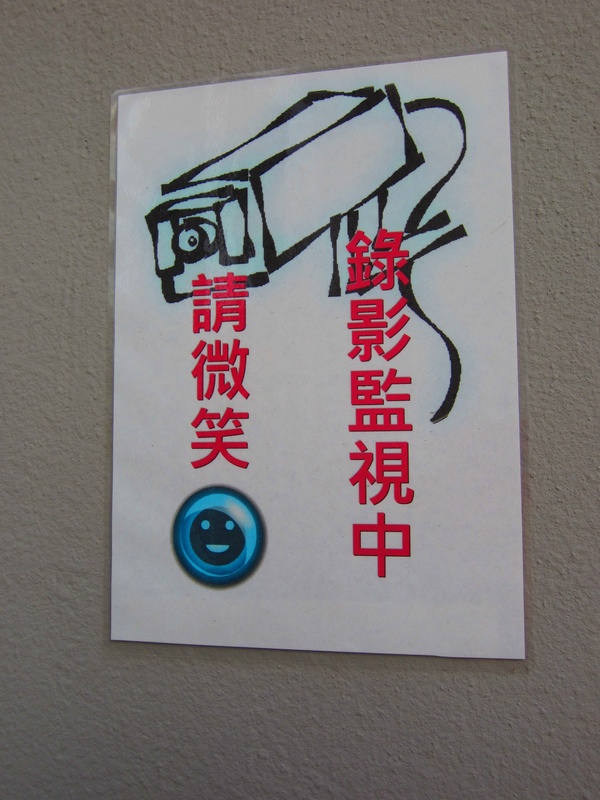 “Please smile, video surveillance!” it reads, at the entry to my school’s library. And what is it watching for? Apparently, the average umbrella thief. The sign hangs directly above the spot where hundreds of umbrellas (which one should never leave home with out… you never know when the next 颱風 could hit) are stored on the many rainy days, keeping our library free of the puddles they make. The sign, and corresponding camera, are polite reminders that if you forget your umbrella, it’s not a great idea to “borrow” a classmate’s. It is interesting that no one litters in Taipei, the streets must be very clean! Here in Vietnam it is the opposite, it is very common to see people discarding things in the street, rather than in a trash can. There is actually a form of street theater that’s designed to be performed for CCTV security cameras! 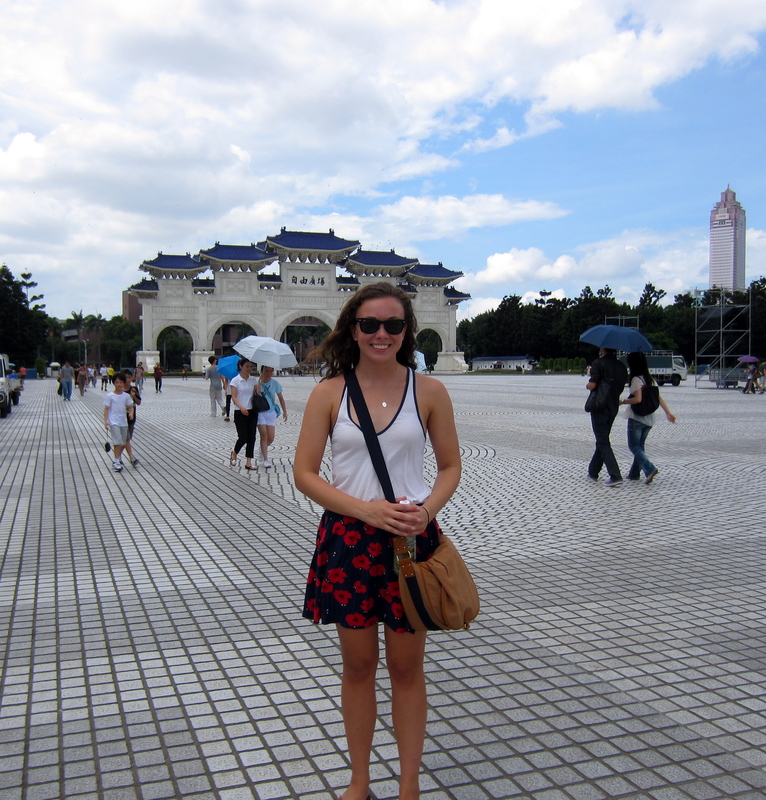 After being in Taipei for ten days, I somehow feel like I’ve seen the whole city… I’m positive that’s not true but I’ve certainly seen a lot: Longshan Temple, Taipeo 101, Nanmen Market, a flower and jade market, Chiang Kai-Shek Memorial, a celebration for the Chinese Valentine’s Day, a celebration for the Chinese Halloween (yes, in the same week,) the famous Shinlin Night Market, Karaoke (!) and the National Palace Museum, which holds most of the world’s Chinese art, saved or stolen depending on your place in the world. It’s really been a whirlwind of experiences so far—being both busy and a little jet-lagged, it’s all blended together a bit. My favorite experience so far is a hike some of us took yesterday. 天上山(The Heavenly Mountain) provided a view and adventure that I thought only existed in guidebooks. We were mostly hoping to get in a little exercise and maybe a few good pictures before our first day of classes (tomorrow!) The almost 5 hour round trip hike took us through a Buddhist temple set in the side of the mountain. There, we were offered water to drink, blessed by a Buddha, said to bring us good luck. As we continued on up the Mountain both official plaques and slabs of stone had Chinese carved into them. I remember two rocks carved with the translations of “Change Mountain” and “Blessed Rock.” We are lucky to have “ambassadors” (Taiwanese students who will work with us on the language, but have also joined us in our orientation adventures.) They often are able to help with translations, or the simple necessity of understanding directions well. The end of the hike came just as the sun was setting on Taipei. Traveling to the “must go” sites in Taiwan has been a great way to orient me to the city, get used to the public transportation (which is incredibly clean,) and get to know the other students on my program. But on the last day activities I am itching for Chinese classes to start. I am looking forward to both to a routine, and to start being seriously challenged with this language. Wow! You’ve been busy. Your hike sounds fantastic. Now I’m curious about the elevation for Heavenly Mountain. We might need to get you to map that route in one of our future blog challenges 🙂 Update us on the Chinese classes when you get a chance! Halloween and Valentine’s day do deserve a mash up…they have a lot in common for many people! What did they do for Halloween?